Historic Preservation is conserving and protecting structures, objects, landscapes and other things that have an significant in history. Preserving is important because it lets people enjoy and see and teach us what the past was like. At first I didn’t know anything about preservation, but just that I liked working with wood. When I used to live in The Dominican Republic, I used to help my Dad build things around his barn. When I moved to Boston I attended a vocational high school, Madison Park High School. There my studies were focused in carpentry where I learned the basic things like how to read a tape measure, how to use power tools, and some of my first experiences framing. Graduating from this school helped me obtain a scholarship to North Bennet Street School. The North Bennet Street School is a private vocational school where I continued to study carpentry and learned how to construct and renovate buildings. I recently completed the 1-year program in June from the Carpentry program. I gained more skills here like how fix power tools, how to keep them sharp, and how to apply math to carpentry. We worked on projects where we built a shed and a barn. Now in my internship I am working alongside carpenter’s continuing to improve my skills and experience. 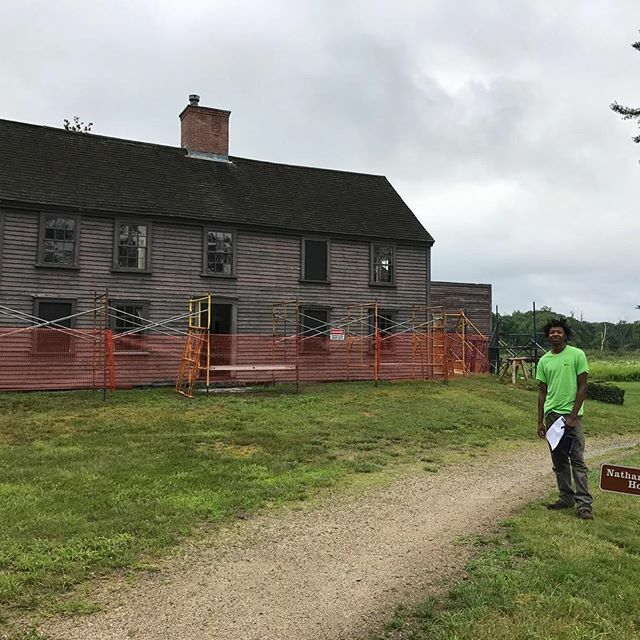 Working on the Meriam House at Minute Man National Historical Park, one task I have really enjoyed during my is restoring the windows. We start this process by putting plastic on the floor to catch the dust and then begin scrapping all the paint off. I wear a Tyvek suit and respirators because the windows tested positive for lead. Lead is a very bad metal for humans that can cause health problems. But since these windows date back to 1820 almost all paint had lead It wasn’t until the 1970’s that lead paint was banned. We gently scrape the paint too because these windows are part of history and we trying to conserve them for as long we could for future generation. By scraping the wood it causes less damage by ripping of small wood fibers. 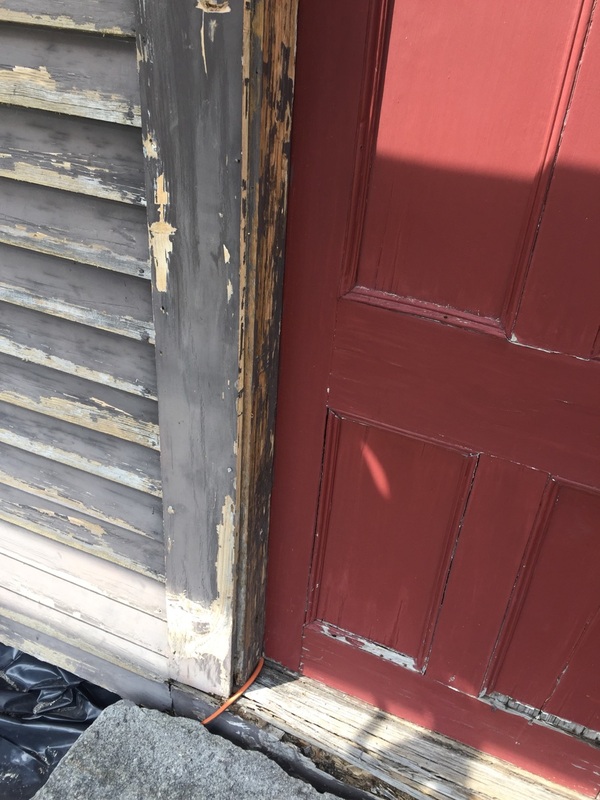 In historic preservation we don’t want to replace the wood with new wood because then it wont have the same authenticity, we want people to see and feel what it was like back then. Getting back to the process of fixing the windows, after scrapping the windows they all got lightly sanded. Then we mixed turpentine and linseed oil to get this mix we call 50/50. This oil helps the wood to stay stronger for longer and be water resistant …because you know oil and water don’t mix! This mix helps revive the wood after being dry for so long. After sanded and oiled we let it dry the put primer on the wood then paint them. The three stages of window restoration. The top photo is before treatment, a lot of the paint is peeling off and wood is deteriorating. The bottom left photo is after scraping and sanding. The bottom right photo is the finished window restoration. This house was built around 1720 and is one of the houses that witnessed the events during the American Revolution around Minute Man National Park. While the window replacement doesn’t sound like a long process it is! This has been a good experience learning about the different methods to preserve wood and I really like this project because I like working in this historic house. It is a pleasure seeing what your work does to help others enjoy it. My mentor, Tim Walsh from the Historic Architecture Conservation and Engineering group said ”…years from now park visitors will look at our work and be there for history and people talking about it”. ← Parks for The People! Fantastic job. It takes such patience and care, I am impressed!